Region - (Pali Region), Mumbai-Goa Highway (3 hours drive from Mumbai). Category: Moderate (3 hours one way). 3 Hours of Climbing on moderate slope and 3 Hours of climbing down. 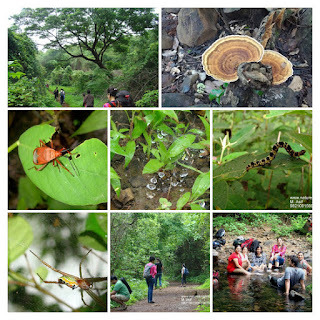 Camp Fee:Rs.990/- (20% Discount for Nature Knights Members). Note: Order items that can be served quickly at the respective restaurant. You have to carry your own packed Lunch. Aerated drinks, fruit juice, bottled water any non-standard items not included in budget (cost of the same has to be directly borne by the customer). No refund on un-utilised resources. Cancellation terms apply, check registration form for details. Breakfast on the way.. (20 minutes for breakfast, order things that can be served fast)..
Expected time to reach on top (01: pm).. Cut-off time to turn back is 2:45pm. Pack everything in your backpack properly. Light items on top and bottom side of bag, heavy item towards center and towards your shoulder and body. Use compression straps to tighten the bag from all sides so that items inside the bag do not keep shifting. At a height of 2200 feet, Sudhagad alias Bhorapgad has a huge plateau of around 50 acres which offers a wonderful camping site. It has a punishment point from here prisoners / criminals would be thrown to their awaiting miserable death, an ancient Bhoraidevi temple and a grand Mahadrwaja. There is a secred chor daarwaja near the Mahadarwaja which if accessible can be used to reach the bottom of the Mahadarwaja bastions. From the Sudhagad platue you can see the ominously standing Tel baila which looks like a giant movie screen rising up from the plateau opposite the Sudhagad platue. The nearest from from here is Ghangad and Sarasgad. If the skies are clear Dukes nose, Koraigad are also visible in the northeast behind Tel-baila. The fort lies in the Raigad region. After Pen on the Mumbai Goa highway you come to Pali which is also famous for one of the Ashtavinayak temples. From here you move towards Paachapur village, about 24 km. The fort can be accessed from Thankurwadi village near Pacchapur.